Volume III. Number 6 Published by Students of New College, Sarasota, Florida Science Faculty Will Not Require Chemistry of Third-year Students Chemistrywillnot be required of third-year students who failed to pass the "Physics-Chemistry" comprehensive examination in their first year, according to a decision annotmced yesterday. In a memorandum to College Examiner John French, the Division of Nat ural Sciences reaffirmed the policy on comprehensive examination make-ups which had been established previously. The science faculty said, however, this policy "does not properly apply to the students of the class of 1967.11 Under this policy the first-year comprehensive examination requirements, are those of the year in which the make-up is taken, not of the year the student failed the comprehensive. Third-year students who originally failed the first-year "Physics Chemistry" course but have subsequently made up either physics or chemistry will no longer be considered deficient in this area. Those who have not made it up may do so by passing either the comprehensive examination in chemistry or in physics, with the corresponding laboratories. Dr. Peter Buri, chairman of the natural sciences, said yesterday new letters detailing students' deficiencies in Nat ural Sciences will be sent to students sometime next week. Buri also said "some means will be found" to give proper credit to those students who, in making up the deficiency, did more than is now required. The entire textofthe memorandum from the Division of Natural Sciences to French follows: "The following policy on comprehensive examination make-ups was first established in the Division of Natural Sciences in September 1965, and was reaffirmed by consensus of the Divisional F ac uity on October 6, 1966. 1. 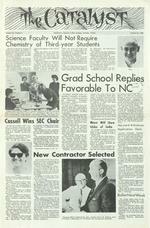 Students with first year com(Continued on page 3, col. 1) October 14, 1966 Buri Grad School Favorable To NCB::v) isterof Scholarships'' "and" ellowships in the Arts and Sciences, listings of financial aid available for graduate study. Helgeson said "it is the student's responsibility to search out sources of financial aid." He said he will help but the wo'rk has to be done by the student. Pauline Jung casts her ballot in Tuesday's election of an SEC chairman while election judge Kenji Oda looks on. Waiting to vote are, 1. tor. : Sally Woodmansee, Irving Benoist, and Bobbie Luther. The voter tumout was the heaviest in the history of New College student government. C assell Wins SEC Chair Second-year student Mike Cassell was elected chairman of the Student Executive Committee this week in a tight contest with Jerry Neugarten, another second-year student. In a special rtm-off election between the two Wednesday, Cassell outpolled Neugarten 99 to 91. The run-off was forced when be duected to either David Allen or Kenji Oda, co-chairmen of the committee. The election for SEC members will be held Tuesday and that for the Judicial Committee on Thursday. Oda noted that students may run simultaneowlyforthe SEC and the Judicial Committee, but that anyone elected at-large to both must resign from one or the other. There are three SEC positions open to each class. Four positions on the (Continued on page 2, col. 5) Graduate schools have responded favorably to considering New College graduates for admission, Graduate Placement Officer Earl Helgeson said yesterday. A total of 11 schools have now indicated they will "accept graduates on their own merits without prejudice because New College is as yet tmaccredited, according to Helgeson. "Not a single negative response" has been received Helgeson said. "The retums have been 100 per cent positive. 11 He said he expects more favorable responses as more schools receive and process com mtmications from him. He also indicated he will finish contacting some 80 graduate schools by the end of the week. These 80 schools were listed by third-year students as those to which they might apply. Those schools which have respondedfavorably include Columbia, Harvard, University of Chicago, Cornell, Stanford, Princeton, University of Florida and Duke. TheY ale law school and John Hopkins and Stanford Medical schools have previously indicated their willingness to consider graduates. Helgeson the only qualified response has come from the Uni versity of Minnesota which indicated a favorable reaction to New College graduates but asked that they take the Miller Analogies test in addition to GRE's and others normally taken here. He said registration forms for the Millertest are available from him or from the College Examiner. Helgeson said he will try within the next two weeks to see all students going to graduate school. He said there are two books all students "should spend two or three hours with." He referred to the "N a tiona! Reg-Mayer Slides W ill of Show India Dr. George H. Mayer, professor of history, will show a series of slides of India tonight at 6:30 in College Hall. Mayer made the slides during a ten month visit to India while he was a Fulbright Professor in American History and Government attached to Gauhati, Osmania and Punjab universities. He said the slides are divided into sections on Indian scenery, village life a1d cultural monuments. New Contractor Selected Cassell neitherofthem gained majority of the votes cast in Tuesday's regular election. Incumbent chairman Steve Hall, also a second-year student, officially turned the chairmanship to Cassell at the close of Wednesday's SEC meeting. Hall polled 47 votes, to Cassell's 79 and Neugarten's 66, in TueS'day's balloting. Afourth candidate for chairman, first-year student George Duffee Bratm, withdrew before the voting began. Cassell is the first chairman to be elected popularly tmder the terms of the revised SEC charter. Previously, the chairman was chosen from among its regular members. Nominating petitions for the SEC and the Judicial Committee are now being accepted by the SupeP. visory Committee. The deadlines for such petitions are 1 pm Sunday and 1 pm Tuesday, respectively. They should A newcontractorhas been selected to c on t i n u e construction on Hamilton Court, Planning Officer Ralph Styles said yesterday. Grah:m Contracting Co., Orlando, is now going through the formalities of t akin g over the job, according to Styles. He estimated the changeover should be completed today. According to Styles only "three or four" days of construction were lost in the change. The former contractor, Settecasi and Chillura, Tampa, left the job Monday, Styles said, thereby defaulting on their contract. A bankruptcy suit was filed against the contracting c o m p any by its bonding aJl:ent October 3. Some work was done by various sub-contr:ctors even after the generalcontractorleft Monday, Styles said. When asked if students will be served Dinner in the new dining facil1ties in Hamilton Court, Styles replied, "I can't back out on it now." He reaffirmed his belief students will eat in the facility by Nov. 24, Thanksgiving Day. He said the work which still has to be done includes waterproofing of the roof over the kitchen area, installation of glass, plastering the kitchen ceiling and installation of kitchen equipment. Planning Officer Ralph Styles, left, consults with T. H. Craham, head of Craham Contracting Co. of Orlando, the new general contractor. In addition, Helgeson urged all students going to graduate school to take the Graduate Record Examination. Although the deadline for registering for the early admission of the test is today, Helgeson said students who want to register today can probably do so by wire orphone and should contact either him or Dr. John French immediately. Harvard Advances Applicatio n Date Harvard University Graduate School of Arts and Sciences has advanced its application deadline to Dec. 1, Graduate Placement Offi cer Earl Helgeson said yesterday. The former deadline was Feb. 1. The change was first tried last year, according to a Harvard press release dated Oct. 2. E.ven tmder the new system, however, supporting documents such as transcripts and letters of recommendation may be received as late as Feb. 1. Helgeson said yesterday other schools may follow Harvard's lead in advancing application deadlines. He urged all students to have their applications in by the end of November. J. P. Elder, Dean of the Harvard Graduate School, said the earlier date was necessitated by the anticipated increase in applications due to the post-war "baby bulge" now reaching graduate school and the increased percentage of college students who go on to graduate study. He anticipates 6,000 applications for the approximately 900 places available in the fall of 1967. This is an increase of 500 applications over last year. Elder said he thinks prospective stllients will not find the early filing date a handicap. Ballet Next Week The fourth ballet series of the Florida Ballet Company, Inc., will be presented Oct. 21, 22,23 in the Asolo Theater. Directed by Miss Jean Spear, who conducts a class for several New Cl>llege girls, the series will include Degas Dancers, Pas de Deux, Harlequina :le at the and Pas de Quatre. Tickets are available from Mrs,. Elizabeth Heimert, Humanities secretary.